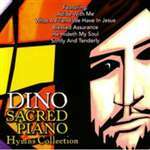 The old sacred hymns have played a major role in most people's formative years. Some of the greatest lyrics and melodies ever written about the glory of God have been penned by these inspired writers. Sit back and take a leisurely walk down memory lane as DINO brings you old favorites like: Blessed Assurance, Tell Me the Story of Jesus, Have Thine Own Way Lord, What a Friend We Have In Jesus, He Hideth My Soul and others.